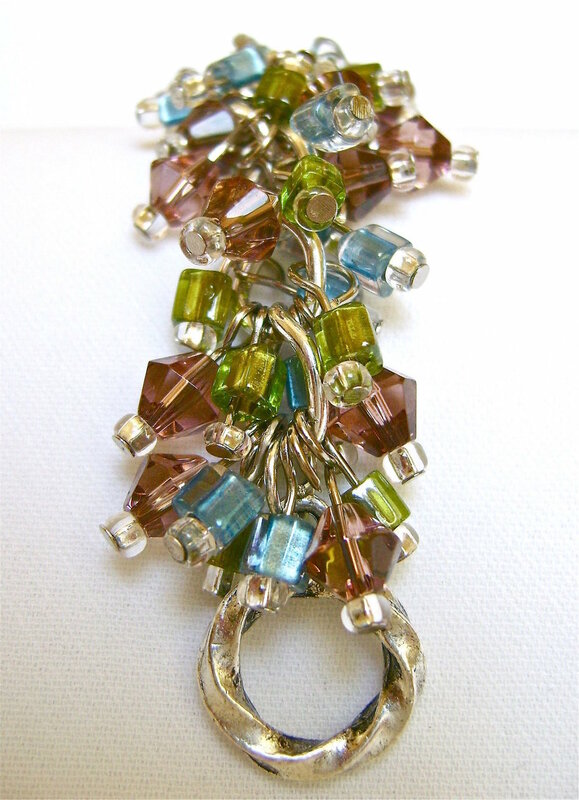 This tri-color bracelet has plenty of style and movement. The blue, rose, and green beads are slipped onto nail head wires and attached to a chain. Consequently, this jewelry is in a constant state of motion... just as you are! You’ll love this bracelet because it’s so loose and free. Use the colors pictured here or choose your own. Perhaps you have an outfit that cries out for a piece of jewelry to pick up its unique hues? This is the answer. Also consider making this as a necklace. It would be a stunning accent for a strapless dress. step 1 - For a 7” bracelet, cut a piece of chain to measure 6” long . (The size of your toggle clasp may require you to make the chain slightly longer or shorter to reach the finished 7” length). step 2 - Create a set of beads for each link in the chain. (A set = 1 blue, 1 rose, and 1 green bead). Thread a crystal seed bead and a blue cube bead onto a nail head wire. Finish by creating a loop in the wire. Do not close the loop yet. Set aside. If you’re unsure of how to make loops/eyes with wire, see the complete instructions in Jewelry Tools and Techniques. step 3 - Thread another crystal seed bead onto a nail head wire followed by a rose bicone bead. Create the loop. Repeat the same steps with the green cube bead. step 4 - Attach the 3 bead set onto the chain link in order by color. Close each loop. step 5 - Move to the next link. Create and attach another set to this link. Repeat until you’ve attached sets to each link in the length of chain. step 6 - Repeat the above steps to fill the opposite side of the chain. When you are done you will have made 36 sets, or 2 sets attached to each of the 18 links. step 7 - Using a jump ring, attach half of a toggle clasp to each end of the chain. My chain contained 18 three-eighth inch links. If you have different size links in your chain, adjust the number of sets needed accordingly.